Part of a series of posts that cover my travel to Greece and the USA in April/May 2016. I wander to the bus station and look for Yiannis the taxi driver. He is there. I ask him how much to take us to the old army barracks then to the beach, then past the old railways yards and across the submersible canal bridge at the north end of the canal then to the Canal Port Office at the south end of the canal where we will meet with PR Manager Theodora Filandra. He says 20 euros. It sounds very reasonable. I ask him to pick us up after breakfast. Most tourists stopping in Isthmia want to go to the ruins at Ancient Corinth so Yiannis is very intrigued as to why we want to go to the barracks. We explain that in 1941 it had been taken over by the Germans to use as a POW transit camp and both our fathers spent several weeks there. It was a filthy, lice infested hole, dysentery was rife and there was not enough food for the thousands of men detained there. The POWs called it the ‘Corinth Cage’. I had visited the barracks in 2013. Then it was a prison for ‘Undesirable Aliens’ and Neil and I were turned away although we did drive around the perimeter, which I asked Yiannis to do again today. More recently the barracks were used as a refugee camp. No-one is being held there in 2016 although there are still guards at the gate. How lucky are we that Yiannis spent 4 months at the camp – it was a camp for officer training when he did his compulsory military service 38 years previously. The reception today was very different indeed and after a lot of talking and telephone calls, Tom and I were allowed inside. No cameras allowed although Rowena took some from outside. 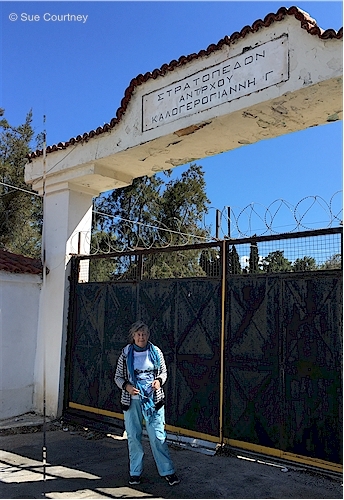 Outside the original ‘Corinth Cage’ gate that the POWS would have marched through. Yiannis took us to Kalamia Beach where the prisoners had to walk approximately a mile to, naked, for their swim / wash, while their clothes were steamed to kill the lice. In the summer the beach will be filled with sunbathers but not on this windswept early spring day. 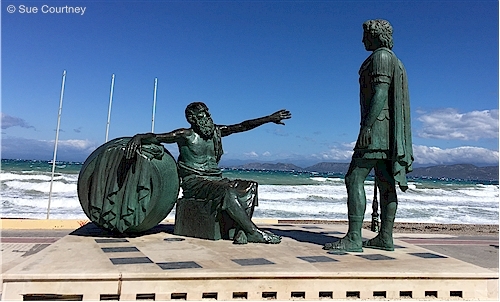 Statue of Alexander the Great and Diogenes at Kalamia Beach, Corinth. Back towards the direction of the canal the old railway yards have rusting carriage after rusting carriage including some that looked like ones that were used to transport the prisoners north. We cross the canal over the submersible bridge (there’s one at each end) to the Loutraki side. On the way to the Corinth Canal Port Office, Yiannis makes a surpise stop at a track adjacent to the canal where we walk to a now disused railway bridge for a peaceful vantage point of the amazing canal. We continue on to what will be one of the highlights of this epic day – a crossing of the Corinth Canal. This entry was posted in Greece, Travel and tagged 1941, Corinth, POW, WWII by Sue Courtney. Bookmark the permalink. Hello Sue, Thanks for sharing your ramblings around the Corinth Transit Camp or better known as the Corinth Cage. My Dad was a guest there after 29th April 1941 when he was captured at Kalamata, he never talked about this time and as I read the history and other material about this time I can see why he did not want to remember or be reminded of. His nightmares throughout his life are testamentary to this. Interesting that it is still being used today as a detention centre, must be a pretty secure facility and forbidding place. Thanks for sharing it gives me more information for my research, I too would love to go and visit these places, but alas unless I win Lotto it is a dream ambition, but you never know. My brother and his wife have been pretty close to Greece and Crete as well as Wolfsberg in Germany but they do not share my passion or interest in this part of Dad’s life, which surprises me. But again I’m rambling on lol. p.s. My Dad was Nicholas Leonard Brady 19th Battlion POW 478 so a very early guest of Corinth Cage I would think. Hi Nick, I do hope you get to Greece sometime. My Dad also taken POW the same day as yours in Kalamata. He was in 18 Bn so part of the 4th Brigade along with the 19 and 20 Bns. In 2013 I followed the 18 Bn’s route thru Greece, story being published in NZ Memories, next issue (June/July) I think.